It’s not everyday that we get to witness the emergence of a new wine region. All the usual suspects, France, Italy, California, seem to have been around forever, but in the high desert of Arizona we are watching history unfold. We talked to some of the folks on the cutting edge of the burgeoning Arizona wine industry to see what the future holds for this up-and-coming region. Everything has to start somewhere. From the ancient Gallic beginnings of French viticulture to missionaries planting vineyards in the 1800’s in California, the histories of the world’s great terroirs have always had their beginnings in small, local movements. We are witnessing something similar in Arizona right now. 100 years from now, wine lovers will look back on this era and wax poetic on names like Callaghan, Bostock, and Hammelman. These pioneering spirits are at the forefront of the Arizona wine industry, a relatively recent development dating back only to the late 1970’s. All these challenges notwithstanding, Arizona vintners have forged ahead with their collective vision. 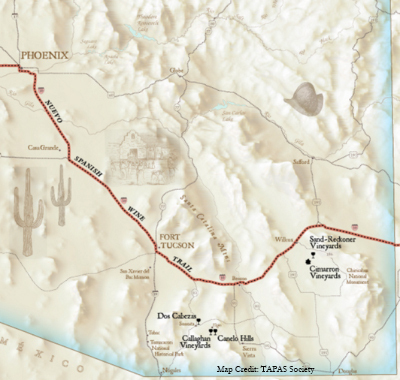 Through careful soil analysis, exhaustive trial-and-error grape selection, and unbelievable perseverance, they have endeavored to put Arizona on the map as the next wine region of note. Arizona is a challenging place to grow anything other than cactus. Heat waves, sporadic monsoon downpours, late frost, and savage hailstorms all conspire to keep farmers on their toes. But the moderating influence of high-elevation coupled with superb soils has resulted in an Arizona-specific terroir that is extremely favorable for certain grape varieties. The price of success out in the desert, though, is hard work, and lots of it. Finding out what grows well in Arizona has taken years of experimentation and replanting. Todd Bostock of Dos Cabezas WineWorks explains: “In the early days of Arizona Viticulture, folks planted varieties that were familiar and available: Sauvignon Blanc, Chardonnay, Zinfandel, and Pinot Noir. Over time folks like Kent Callaghan and Al Buhl started looking at lesser-known varieties from other regions with similarities to Arizona: Mourvedre, Petit Verdot, Vranec, Graciano, and Tannat, which, being thicker-skinned and later-budding, have shown promise.” By selecting varieties that are particularly suited to Arizona’s high-elevation areas like Sonoita and Willcox, these vintners have seemingly found their niche. The thing that really sets Arizona wine apart, however, is the human element. Arizona winemakers have a fierce dedication to quality, and their tireless efforts are beginning to pay off. A wine region isn’t created overnight, after all, and it takes many years of hard work and experimentation to figure out how to gain a foothold in the increasingly competitive market for fine wines. The recent cultural shift toward a love of all things local has helped. The ascension of “Locavore Culture” has not skipped over Arizona, and it’s becoming more and more common for restaurants and wine bars in the state to have an entire section of their wine list dedicated to local producers. Dos Cabezas’ Kelly Bostock attributes this in part to the DIY nature of the Arizona wine industry. These producers really started from scratch, pulling themselves up by their own bootstraps to build the necessary cultural infrastructure, and consumers appreciate that approach. Far from being a strictly regulatory concern, the designation of American Viticultural Area lends a certain gravitas to a wine region. Defined by distinctive geographic elements such as climate, soil, and elevation, much like the Austrian DAC system, the AVA classification is granted through the Alcohol and Tobacco Tax & Trade Bureau. So far, only two AVAs have been officially recognized in Arizona: Sonoita, in 1986, and Willcox, in 2016. Both are typical of the high-elevation desert terroir that gives Arizona wine its unique appeal. The Arizona Vignerons Alliance, on the other hand arose out of the need for an Arizona-centric quality control organization. Founded by a collective of Arizona winemakers, including the Bostocks, Kent Callaghan, and the Hammelmans from Sand-Reckoner Vineyards, this AVA focuses on the unique qualities of Arizona and its wines. According to Kelly, the AVA is not a promotional entity, rather it aims to solidify a tight set of quality standards to ensure that the wines remain faithful to their origin. Through certification panels and extensive data collection, the AVA has made significant headway in defining Arizona wine. Callaghan Vineyards has been crafting exquisite wines which express the region’s unique soil and climate for over 25 years. Pioneers of Arizona’s burgeoning wine industry, Harold and Karen Callaghan first planted the Buena Suerte vineyard in 1990, only to have it decimated by a heat wave. Undaunted, the Callaghans began anew, patiently learning the terroir and experimenting with different varietals and rootstocks to discover which grapes were capable of fully realizing the potential of Arizona’s wine country. Callaghan Vineyards, now helmed by Kent and his wife Lisa, has overcome these adversities and now boasts an impressive roster of exceptional wines. Keeping with his parents’ love of European wines, Kent mostly cultivates Spanish varieties: Grenache, Mourvedre, and Tempranillo, as well as unusual French varieties such as Petit Verdot and Tannat. The unique mix of altitude, harsh climate, and calcium-rich, caliche soils favor these thick-skinned grapes, and lend the wines distinctive aromas and flavor profiles. Through years of hard work and dedication, the Callaghans have discovered how to express the singular terroir of their vineyards in their intense, earthy reds and fresh, dry whites. The Callaghans have been hailed as pioneers of Arizona winemaking, and Kent and Lisa continue to lead innovation in the burgeoning industry as a founding member of the Arizona Vignerons Alliance. Callaghan’s wines have earned accolades from from the likes of The Wine Advocate and Decanter Magazine, and have been served at no less than three White House dinners. Varieties: 65% Graciano, 17% Petit Verdot, 9% Tempranillo, and 9% Cabernet Sauvignon. Founded in a farming community south of Willcox, Dos Cabezas WineWorks has been producing innovative wines from the particularly challenging terroir of Arizona’s high desert for over two decades. In 1995 Al Buhl, a pioneer of Arizona viticulture, planted the 80-acre Cimarron Vineyard in Kansas Settlement with unconventional varieties like Malvasia Bianca, and Dos Cabezas was born. In 2006, new owners Kelly and Todd Bostock moved the winery north to Sonoita. 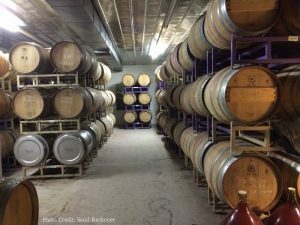 With their unique approach to winemaking and willingness to eschew convention, the Bostocks are well suited to the often precarious enterprise of desert winemaking. 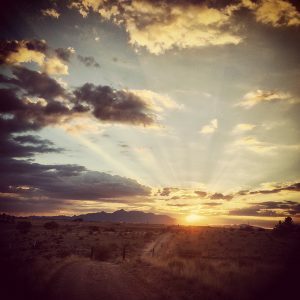 Sourcing high-quality grapes from two estate vineyards now, after adding the Pronghorn Vineyard in Sonoita, Kelly and Todd have developed a deep understanding, both of their region and the techniques necessary to create wines which express the high desert terroir. While the soils of the original Cimarron Vineyard are mostly calcium-rich caliche, the newer Pronghorn site boasts deeper, loamy soil producing higher yields. Under the expert direction of Kelly and Todd, these elements are combined to produce unique, fascinating, award-winning wines which honestly and boldly express the terroir found in this little corner of Arizona. While Todd is in the vineyard or cellar, you can find Kelly busy as the president of the Arizona Vignerons Alliance (AVA), and they have recently partnered with like-minded Arizona businesses to open Garage East, a funky wine bar/shop/restaurant in Gilbert. Respected wine critics Stuart Pigott and Jon Bonne have both lauded Dos Cabezas’ wines. Stuart touted the Meskeoli as the “Riesling innovation of the year” in 2015, while Jon found their El Campo red blend exciting enough to name them one of Ten Winemakers to Watch in 2015. Kelly and Todd’s wines have garnered favorable mentions in many other publications as well, among them Food and Wine Magazine, Men’s Health, and azcentral.com. Relative newcomers to the Arizona wine scene, Rob and Sarah Hammelman have wasted no time making a name for themselves with Sand-Reckoner Vineyards. 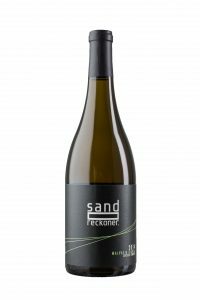 In a nod to the sandy loam soils of the vineyard, Sand-Reckoner is named after an ancient Archimedean book that suggested the size of the universe could be calculated using grains of sand. 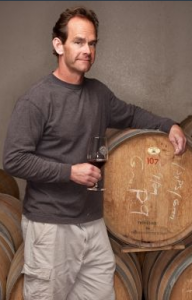 Formerly a math teacher, Rob became interested in winemaking in 2000 when he took a summer job with influential Arizona vintner Kent Callaghan. 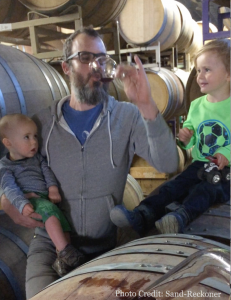 His experience there, along with subsequent winemaking adventures in France and Colorado, where he met his wife Sarah, instilled Rob with a passion for terroir. In 2010, the Hammelmans purchased their 12-acre vineyard in the southeastern Arizona mountains and never looked back. 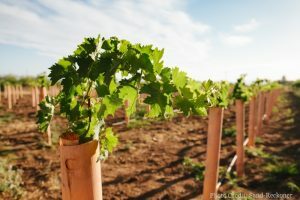 While the star of the Hammelmans’ vineyard is the versatile, Arizona-loving, Malvasia Bianca, Sand-Reckoner grows a wide variety of grapes, including Nebbiolo, Sangiovese, Sagrantino, Montepulciano, Syrah, Petit Verdot, and Zinfandel. Rob and Sarah’s methodical approach to viticulture has led them to grapes that not only thrive in the wildly variable climate, but also express the unique high-desert terroir. To supplement the supply of fruit from their estate vineyard, Sand-Reckoner partners with other growers in the region, including Blue Moon, Deep Sky, Red Tree Ranch, and Rhumb Line Vineyards. The past 30 years has seen incredible progress in the Arizona wine industry, and the future looks very bright indeed. Arizona wines have garnered praise from critics like Elaine Brown, Jon Bonné, and Stuart Pigott, and are gaining exposure nationally, with seminars dedicated to Arizona at important trade events. 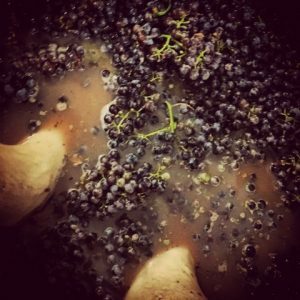 Both TexSom International Wine Awards and Hospice du Rhone held seminars focusing on Arizona in 2018, the latter featuring Todd Bostock as a presenter. 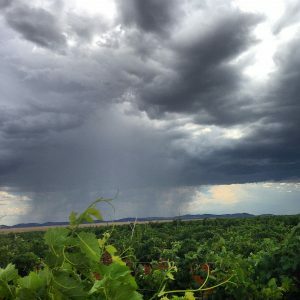 It’s no small task to create a new wine region, as these vintners can tell you, but as Kelly said, “All the pieces are in place.” Arizona winemakers are unique folks, and their dedication to producing quality wine in challenging conditions is finally starting to pay off. If you’re looking for wines that reflect not only a sense of place, but the heart and soul of the winemaker, you could do a lot worse than an Arizona wine.